Kindoki, African and diaspora medicine and magic. Hello all! I just fixed the comments feature. I was wondering why there was so little feedback, and thought folks were just super quiet. The problem was that there was a conflict with some of the anti-spam plugins. It’s solved now though, so if you would like to comment on any of the recipes or spells, or have any questions, feel free to ask. Sheloya (Sis. Nicole) is a licensed U.L.C. Modesto minister, spiritual counselor, and sorceress.She believes in education and empowerment of individuals with a holistic approach to spirituality. 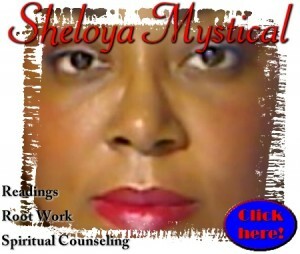 Order a bone reading from Sheloya to find out what the Spirits have to say about your future. I have only just uncovered your wonderful site! I am SO tuned in. Your words are just what I needed to hear, thank you for sharing your wisdom. I bow to your deeply reverent expression, your experience and truth. I feel honoured to have met you although virtually, and expect I will be spending many more hours and days here. Thank you for the compliments. I am honored that you received good things from my writings. Please feel free to ask any questions you like or recommend recipes or articles. Blessings to you and yours! Ashe! Many blessingz. I am ordained (ULC). I am looking for a mentor to enhance my spiritual capabilities. Do you know of any? I need a reading for a very good friend, she struggels with so much negativiti around here. What can she expeckt from the future. My name is Stjepan and I’am from Croatia. Hello I’am Stjepan(Stef) from Croatia. I need help. We are having problems with very bad energys. With we I meen my family and an very good friend. Please help. I’am catholik I believe in good and bad in the mercy of God. But a little bit of help can’t be bad. What kind of negative energy? Are bad things happening in patterns? Are things that should work not working? Is there illness? Tell us more of what’s going on, and maybe we can help or at least point you in the right direction. 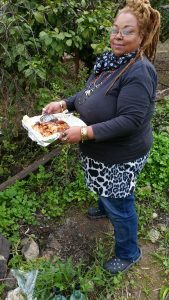 Do you have traditional healers or mystics in your local area? Save cooking oil that is past its expiration date for use in magical oils. Unless it smells off, it is still good enough for the skin. This site has received views since November 25,2016. ©2014 Zindoki.com and respective authors. All rights reserved. Linking and re-posting of content is permitted only with credit and proper attribution.